Welcome back to Green Screen, where Grist writers break out their inner film buffs to talk movies, television, video games, and any other heretofore undiscovered screen-based media forms. This week, our rotating cast turn to the soon-to-be released Jurassic World, the latest installment of the Jurassic Park franchise. The Basics: Because apparently bringing dinosaurs back from the dead gets boring after a couple of decades — news to us! — this latest installment of “Jurassic Wow!” features a super-duper, genetically enhanced dino that makes T. Rex look like a featherweight. Cue chaos, motorcycles, breathy dialogue, and lots of dinos chomping lots of things/people/other dinos. Why it’s green: Genetic modification is in the headlines a lot these days (as one of our panelists knows especially well) and this movie tests the tension between what we think of as “natural” and what is actually good for us. At its heart is a familiar question for greenies: Can humans make the world better? Or does our tinkering inevitably screw things over? Suzanne: It was interesting to revisit the Jurassic Park franchise in 2015. Perhaps because I was a child who didn’t know anything about anything at the time, but the original seemed like pure sci-fi fantasy. This one, on the other hand, has an air of plausibility. Genomics has advanced so much since the original movie came out in 1993. Just a few weeks ago, Chinese researchers reported the first ever attempt to genetically manipulate a human embryo. Scientists all over the world are genetically engineering microbes to make things like spider silk and perfume. George Church, a geneticist at Harvard Medical School, is trying to engineer a woolly mammoth-elephant hybrid. 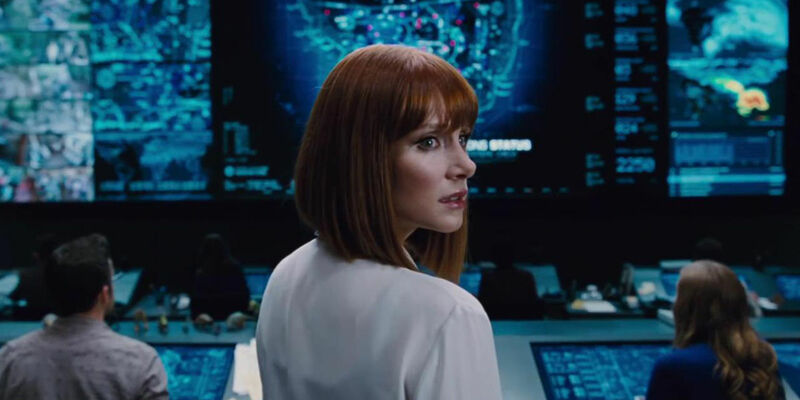 At some point, a character in Jurassic World says something about progress being inevitable — i.e., someone’s going to keep making scientific advances; it’s just a question of who. That struck a chord. Whether we’re talking advances in genetic engineering, robots, consumer electronics, or whatever, there’s a certain feeling of inevitability. Amelia: I’ll admit, I was disappointed. “Because humans have short attention spans, like goldfish, and must to be entertained” is a pretty uninspiring justification for any cool new innovation, and it leaves out a lot of the serious and thought-provoking questions about ecosystem management, conservation, and resiliency behind real-life considerations of de-extinction. Suzanne: Not only did the movie — and its characters — seem largely uninterested in those questions, but they seemed largely uninterested in science altogether. The heroes in the original Jurassic Park were two paleontologists, two child bookworms, and a mathematician. In Jurassic World, they’re a navy SEAL (who, admittedly, seems to know a lot about animal behavior), a frazzled park administrator, an angsty teen, and just one child bookworm. Even the head scientist (played by the same actor in both movies) came off as a pretty OK guy in Jurassic Park, but kind of shifty and weird in Jurassic World. Nathanael: About the “perils of progress” thing: In the dialogue this was a radiant cliche turned all the way up to 11, but I think the movie itself was actually surprisingly nuanced about this. I don’t want to introduce too many spoilers, but humans messing with nature and technology not only causes the problems in the movie, it also saves the day. And ultimately, the issue isn’t that more technology is worse (Dr. BD Wong, scientist, points out that ALL the dinos are genetically engineered) — the difference between the good dinos and evil ones has nothing to do with technology, and everything to do with love. It’s not saying science is bad, it’s saying love your monsters. Ted: When I saw that whole BD Wong convo, I thought, “this was basically written for you as audience, Nathanael” — and I wasn’t the only one. Nathanael: Ha! Truth be told, that may be the spot where it won me over. Suzanne: What would have otherwise been a pretty eh movie turned out to be somewhat enjoyable for someone like me (a Jurassic Park superfan), because every reference to the original was like a little hit of nostalgia. That said, the high wasn’t that great, so to fellow superfans: Maybe just rewatch the original. 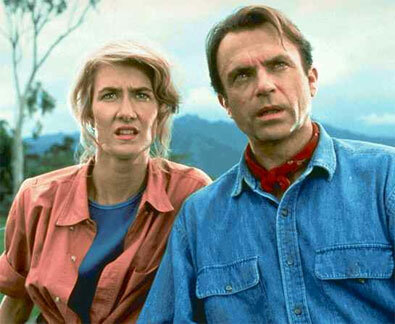 And to Jurassic Park newbies: Definitely just watch the original. Nathanael: Isn’t this just your nostalgia talking, Suzanne? I mean, the first one wasn’t actually a good movie. But — like this one — it was great fun, in my humble opinion. Ted: Whoa, whoa, whoa. The first one was a good movie, I think — or you could mount a reasonable defense, certainly more so than for this claptrap of lumbering CGI and dusty, musty beware-the-perils-of-man-playing-God sci-fi tropes. Jurassic Park was tightly plotted, had a less-is-more approach to the effects, and didn’t forget that there was a lot to love about dinosaurs beyond using them as stand-ins for Godzilla or Aliens. I’m thinking about the moments of quiet wonder when brachiosaurs swing their heads out of the bushes, or where species’ behavior (however made up) actually drove interesting plot points — like raptors learning how to open doors, etc. Nathanael: I can’t believe this, but I think I’m going to have to be the defender of Jurassic World here! Suzanne: No one has to be the defender of Jurassic World. It was entertaining, sure, but I have to agree with Ted. Nathanael: But I loved the fact that the screenwriters wrote their own challenge into the script. Right? Whether you are running a theme park or a movie franchise, you have to figure out how to keep upping the ante. It’s all on a continuum: from the dinosaurs the kid is flipping through in his ViewMaster in the beginning, to Jurassic Park, to Jurassic World in IMAX 3D, to an actual theme park. And because of this, the question the film poses (awkwardly, sure) actually implicates viewers: Maybe, to quote Chris Pratt as Owen, “progress should lose for once.” But I doubt many people would actually want to go back to the ViewMaster. Ted: To me progress losing, in this case, would be rejecting that self-aware, up-the-ante blockbuster and coming up with something focused and tighter. Can you imagine, for instance, if after the setup of explosive dinosaur escape it zoomed in on one vacationing family’s survival? Or if scientists who worked in the park were more than one-note evil geniuses or predictors of doom — what if they had to use brains, ingenuity, and dino-know-how to corral each of the crazy dinos? You might have something really special, and even a bit more legit sci-fi. Nathanael: For me, it crossed the line from eye-rolling silliness, to incandescent ridiculousness at some point. I just found myself guffawing at the camp of it all — so much fun!